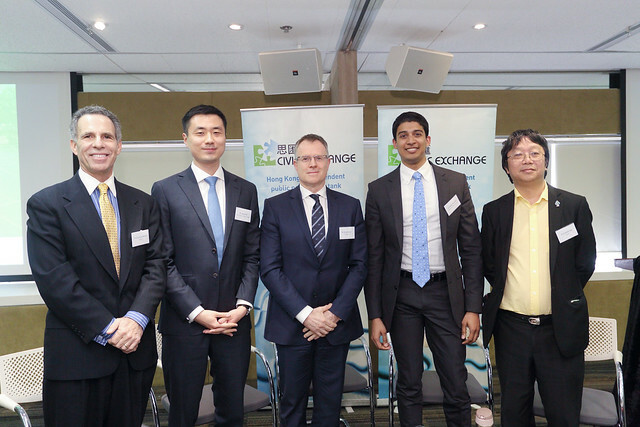 This seminar is co-organised by Civic Exchange, Hong Kong University of Science and Technology’s (HKUST) Institute for Public Policy, and HKUST IEMS. Varun Sivaram, fellow at the US Council on Foreign Relations, advisor to New York Governor Andrew Cuomo on Reforming the Energy Vision, and advisory board member for both the Woods Institute for the Environment and the Precourt Institute for Energy at Stanford, articulated the major objectives of international partnerships to invest in clean energy technology, reviewed recent progress—especially between the United States and China—and made recommendations for how the world could best leverage the political will displayed at the 2016 Paris Climate Change Conference. Dr. Sivaram emphasized that addressing climate change requires advanced, low-carbon energy technologies, especially in the realm of large-scale consumer and industrial power generation. While investment in clean energy deployment rose to $329 billion in 2015, investment in clean energy innovation was less than 1/10th of that figure. A major milestone of the Paris Climate Change Conference was that twenty countries agreed to double their funding for innovation and research and development on clean energy by 2020. Dubbed “Mission Innovation,” their pledge was supported by the “The Breakthrough Energy Coalition” of 27 billionaires committing to invest patient, flexible-risk capital for projects which will provide the economic proof points necessary for the mainstream, market-driven, clean energy economy required for a more environmentally sustainable future. With respect to the prospects for various types of renewable energy to gain traction in the energy markets of countries around the world, Dr. Sivaram pointed out that as solar and wind power become increasingly economical and more pervasive, existing technologies may become less economically viable. Dr. Sivaram and his colleagues at the Council on Foreign Relations propose a cost target of US $0.25 per watt—down from US $0.70 per watt in 2012—at which point solar and wind can achieve widespread economic viability. However, such a target can only be met with the introduction of new technologies and/or major efficiency improvements in existing technologies. Dr. Sivaram concluded by emphasizing that the most crucial aspect of the Paris Climate Change Conference and Mission Innovation is international coordination, as countries navigate incentives to cooperate and fight climate change as well as to compete for national returns from public renewable energy investments. Addressing climate change requires advanced low-carbon energy technologies. At the Paris Climate Change Conference, twenty countries including China and the United States, agreed to double funding for research and development of clean energy technologies by 2020. Dubbed “Mission Innovation,” their pledge was supported by the “The Breakthrough Energy Coalition” of 27 billionaires committing to invest patient, flexible risk capital for projects which will provide the economic proof points necessary for the mainstream market-driven clean energy economy required for our planetary future. A crucial aspect of Mission Innovation will be international coordination, as countries navigate incentives to cooperate and fight climate change as well as those to compete for national returns on public investments. In this seminar, Dr. Varun Sivaram will articulate the major objectives of international partnerships to invest in clean energy technology, review recent progress—especially between the United States and China—and make recommendations for how the world can best leverage the political will displayed in Paris. Dr. Varun Sivaram is the Douglas Dillon fellow at the Council on Foreign Relations. He is also an advisor to New York State Governor Andrew Cuomo on Reforming the Energy Vision (REV). He is a member of the advisory boards for both the Stanford Woods Institute for the Environment and the Stanford Precourt Institute for Energy. Before joining the Council, he was a consultant at McKinsey & Company. Dr Sivaram has published widely and is a Truman and a Rhodes Scholar. He holds degrees from Stanford University in engineering physics and international relations and a Ph.D. in condensed matter physics from St. John’s College, Oxford University. He lives in Washington, DC.